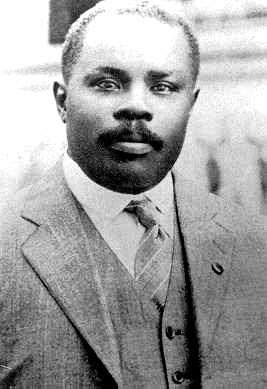 The Jamaica Observer reports that Presidnet Obama has "flatly rejected" a request for a posthumous presidential pardon for "Jamaica's first national hero," Marcus Mosiah Garvey (see our writing on Garvey's story here). The report says Florida-based Jamaican-born attorney Donovan Parker "has been writing to president Obama every week since January requesting a posthumous pardon for Garvey." The Sunday Observer acquired a copy of one such letter as well as the "first ever" reply from the White House." "Many posthumous pardon requests would likely be based on a claim of manifest injustice, and given that decades have passed since the event and the historical record would have to be scoured to objectively and comprehensively investigate such applications, it is the Department's position that the limited resources which are available to process requests for Presidential clemency -- now being submitted in record numbers -- are best dedicated to requests submitted by persons who can truly benefit from a grant of the request,"
Now, there are doubts as to whether or not President Obama has ever actually seen a request for the pardon. Parker says, "I think if President Obama reads it, he will sign it." Similarly, the Head of the Marcus Garvey-founded People's Political Party, says, "The language used in the reply is most disdainful. It makes you wonder if Obama actually read the request. Obama must know about Garvey, who is the forerunner of the civil rights movement. It is most disappointing." See story here. While we agree with the general policy expressed by the Pardon Attorney (for a variety of reasons), we cannot help but also add that, should the President find the lure of hollow, symbolic pardoning irresistible (as did Bill Clinton and George W. Bush), then, in our view, Marcus Garvey is a much, much more deserving recipient than Jack Johnson.